Like so many other early Blue Tabbies, 'Skittles' was probably seen as a virtual stepping stone to the production of more solid 'Blue' Persians. Others from this era, included 'Woodburn Billy' born in 1887, who was one of the most successful of all the early blue tabbies. Others between the period 1887 and 1893 included Mrs. Herring's 'Queen Victoria' (NCC:1439); Miss C.S. Marshall's 'Dolly' (NCC:1009); Mrs. Kennaways 'Fayline' (NCC:1117); Mrs. H.B.Thompson's 'Biddy of Islington' (NCC:1228): the male 'Breamore' (NCC:1716) owned by Mrs. Trowbridge Day; and a male and female both owned by The Hon. Mrs. McLaren Morrison, which were 'Aden' (NCC:1415) and 'Marabout' (NCC:1416) respectively. Blues and Blue Tabbies were appearing in litters of Blacks bred to Whites, from litters of White to White and from Brown Tabbies bred to Blacks where both of the parents were clearing carrying the genes for dilution. In breedings between Tabbies and Silvers or Tabbies and Smokes, these dilutions were beginning to appear more often, and for those breeders that were curious about the colour, and had already had some familiarity with it, in 'Russian' shorthairs, the prospect of successfully breeding longhairs of this colour now seemed very much within reach. For many, the blue tabby was simply perceived as an initial first step in this process. 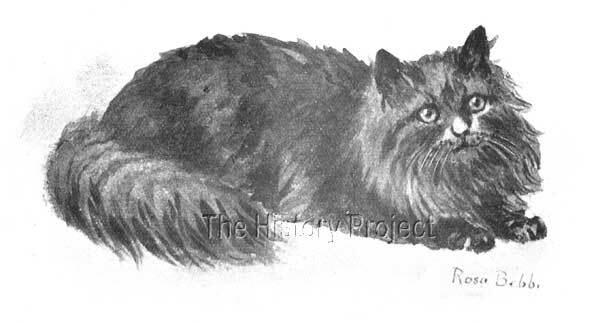 The registration for this male is found originally in Volume 2 of the National Cat Club Studbook (NCC:1266)1, where he is simply listed under the name 'Skittles'. He was born in November 1890, bred by Mr. Fryer, of South Kensington. His sire is listed as 'Brownie' (likely to have been a Brown Tabby) and his dam is simply listed as 'Unknown'. So there is no way of knowing whether his dam was a dilute, but if we presume that his sire was a Brown Tabby, then in order to produce a blue tabby, the sire had to be at least carrying the dilution. 'Skittles' was also registered as a Blue Tabby from the beginning, but despite this, like his older contemporary, 'Woodburn Billy' was often referred to as a Blue. Even in Charles H. Lane's book, from which our illustration is taken, he is listed as a notable winner and as a 'Blue', with no mention of him being a tabby!. He was eventually re-registered after his change of ownership from Mr. Fryer to Miss Gertude E. Jay, as 'Holmwood Skittles'. 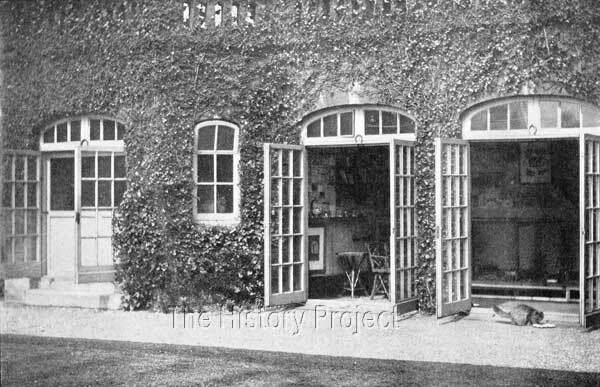 Miss Jay, was considered to be numbered among those breeders who were especially enthusiastic supporters of the blue Persian variety, alongside the likes of Miss Hilda Patterson, who very early on presented Queen Victoria with a Blue Persian cat as a pet. The recorded progeny of 'Holmwood Skittles' are actually very few in number, but given that we have evidence that he was still siring at nine years of age, its seems probable that there were many kittens born but not registered about which we have no knowledge. Among those we do know about were two females, either blues or blue tabbies, respectively named 'Miss Muffet' (CCR)3, born 1st September,1898 and 'Witton Blue Hyacinth'(CCR)3, listed as a 'tabby', born in 1899. Interestingly, 'Miss Muffet' is recorded as bred by Mrs. Greene and owned by Miss Frances Simpson, another staunch supporter of the Blue Persian. The dam of 'Muffet' is recorded as 'Sylvia' but there were a great many cats named 'Sylvia' from this period. As Miss Simpson was both a fancier of Tabbies and of Blues, it is not unrealistic to expect that 'Miss Muffet' was probably either a solid Blue, or a Blue Tabby. The dam of 'Witton Blue Hyacinth' is shown as 'Banshee' (colour not given) with her parentage shown as simply 'Adam, ex Ma'. 'Hyacinth' was purchased by the young fancier, the Hon. Phillip Wodehouse, and from her he bred both blue tabbies and shaded silvers. Given that 'Hyacinth' is listed as a tabby and has the word 'Blue' in her name, and when mated to a Silver, produced Blue Tabbies; it would be a reasonable assumption that she was in fact herself, a blue tabby, like her sire. Miss Jay's 'Holmwood Skittles' was a blue tabby, making his mark during the initial rise in the popularity of the colour 'blue' amongst long-hairs, in the years between 1887 and 1893. These were the years when the blue was striving to gain recognition as a separate colour variety, and whilst also striving to prove that it could hold its own as a 'self' colour, alongside the already long-established solid 'Black' or the glamorous solid 'White'. It would not be long before blue tabbies faded into insignificance, beside the tide of change that saw the 'Blue Persian' rise upon the crest of a wave that just kept coming year after year, only to be challenged from time to time by the current stirred by the epic popularity of the 'Chinchilla'. In the twenty-first century the wheel of fortune has turned, and within the Persian breed, we are now more likely to see a Blue Tabby or Blue Tabby Harlquin or Van, compete for top honours than we are to see a solid blue. Both colours are of value, and it is important that we attempt to preserve the best of both for a future that is as yet, unknown.